Now that 2018 annual reports are filed for most firms in the S&P 500, we are picking over the data for interesting nuggets. Today’s data point — restructuring costs. That acceleration might be a bit misleading, however. See Figure 1, below. The high-water mark for restructuring costs came in 2016, at $29.3 billion. Since then total costs are below $25 billion, although they’re still well above annual averages in the first part of the 2010s. It’s also worth looking at average restructuring costs per filer. Those costs are up 14.7 percent, from $131.5 million in 2017 to $150.9 million in 2018 — and they are well above the average of $118.8 million we saw 2012-2014. 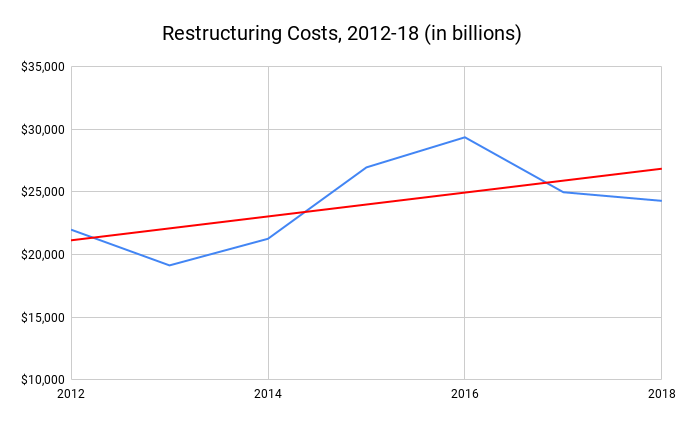 Critical point: the number of firms reporting restructuring costs also fell, from 190 in 2017 to 161 last year — and we’re still waiting on roughly 50 more 2018 reports from the S&P 500. So it’s possible that by the time those last firms file, their numbers might shift the average substantially. We don’t know. Meanwhile, severance costs seem to be moving in three-year cycles, with spikes in 2012, 2015, and (apparently) 2018. Total costs for the S&P 500 are gently rolling downward, but average costs per filer are moving upward. See Table 1, below. We pulled this data together quickly from our Data Query Tool, which is just the thing when you want to find trends in data among large groups of companies. In these cases here, we asked the search tool to return aggregate and average numbers — but you can also get results for individual companies within your sample. When we did that, we quickly found the 10 largest restructuring charges of the last three years. 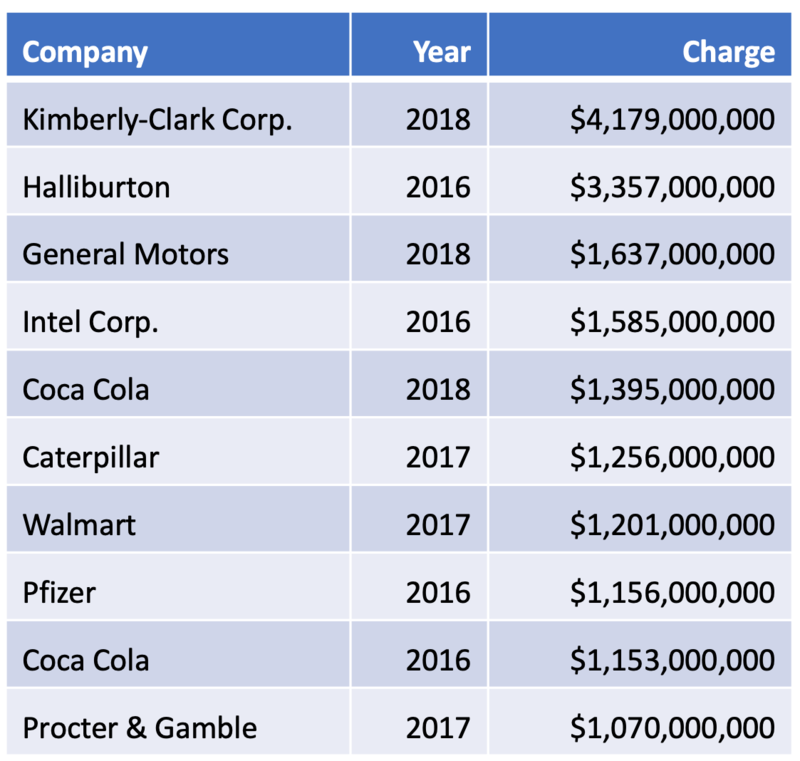 Topping the list was Kimberly-Clark Corp., with a $4.18 billion charge it announced for 2018. The top 10 are below, in Table 2. And what were those charges about, exactly? Then you can shift to our Interactive Disclosures database and research whatever firm catches your eye. Typically, that footnote disclosure will include details such as which operations may be scheduled for restructuring, how many employees might lose their jobs, and more. It’s also worth watching how those disclosures change over time. As we noted in our original restructuring post three years ago, firms have a habit of announcing one set of targets with a restructuring goal — and then somehow expanding those numbers and costs over time.